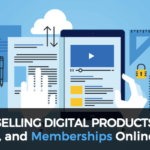 Read Part One and Part Two of our series on selling digital products, online courses and memberships. 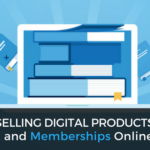 If you’re running an online coaching business, chances are you have at least a couple of digital courses, memberships, and products. These tools are awesome for building your reputation, introducing new clients to your offerings, and giving advanced insights without needing to sacrifice any additional time. When these digital courses can be found online, that also makes it easy for your clients and customers to access them whenever they’re ready. They can stumble across your content and make a purchase, or finally invest in a big-ticket item they’ve been eyeing for weeks. But in order to make the sales process as smooth as possible for your customers, you need to have a solid checkout platform. The average abandonment rate for online shopping carts is 69.23%. If your checkout platform isn’t efficiently pushing your customers to finally convert, you could be losing serious sales. However, a checkout platform like SamCart can help you create beautiful checkout pages that help to convert more leads into paying customers. Is Automation Agency The Right Fit For You? Take this quick quiz to find out! SamCart is an online checkout platform that helps you create high-quality landing pages, checkout pages, and more to get the most out of each and every sale. SamCart focuses on making the customer’s checkout process as easy as possible, increasing their chances of converting and even supplying them with opportunities to purchase more. This can not only increase your conversions, but also encourage even more sales. SamCart also offers users a backend dashboard that allows them to keep track of how their sales are performing. With these analytics, you can see which courses, products, or memberships are contributing the most to your bottom line, as well as how interest changes. SamCart offers an all-in-one approach to the checkout process. From making it easier for your customers to pay for the products they want, to providing testing solutions to ensure you’re maximizing conversions, SamCart ensures you don’t need an additional tool to get the job done. Here are just some of SamCart’s top features. Payment Plans: SamCart allows users to pay over time, increasing your chances of selling big-ticket courses or memberships. A/B Testing: Find just the right landing page or checkout page to convert high-quality customers. Order Bumps and 1-Click Upsells: Easily allow shoppers to add items to their shopping carts as they’re checking out. Trial Offers: SamCart allows for free or paid trial offers to give users a taste of what you have to offer. Coupons: Easily offer coupons within your checkout cart experience. Subscriptions: Manage membership subscriptions without a second thought. Easy Custom Branding: Make your pages entirely your own with easy-to-add branding. SamCart also makes it easy to manage affiliates. If you’re looking to add affiliate marketing to your toolbox, SamCart can help you manage your affiliates and their sales. While SamCart allows for easily customizable pages, you do need to work from one of the templates they provide. They currently offer about 18 customizable templates. For some, this is more than enough to create high-quality checkout pages that convert customers. However, compared to other platforms, such as ClickFunnels, this can feel rather limiting. There can also be a bit of a learning curve when using SamCart. If you’re not totally experienced in creating checkout or landing pages, you may find that SamCart is difficult to use the first few times you create a page. SamCart connects with various apps and programs to help make your life easier. Some of those integrations include ActiveCampaign, Constant Contact, CovertKit, GetResponse, HubSpot, MailChimp, InfusionSoft, and Ontraport. SamCart also connects with both PayPal and Stripe, making it easy to manage purchases and get money. There are a number of checkout platforms out there that you can choose from, such as ThriveCart that offer similar features and integrations as SamCart. Comparatively, SamCart is a monthly subscription which can add up over time, while ThriveCart is currently still available as a one-time lifetime license. SamCart has 18 different templates with custom fields, which is much more than ThriveCart’s four templates. SamCart also doesn’t include a funnel builder, which you can find with ThriveCart. SamCart also doesn’t offer real-time currency exchange, potentially creating some friction if you have customers all over the world. If you’re an Automation Agency subscriber, we can help you get your landing and checkout pages set up within SamCart. Go ahead and send us a task to get started! If you’re interested in learning more about how Automation Agency can help you sell more products, courses, and memberships, start by taking our Right Fit quiz to see if we’re a good fit for your business. Thinkific, Kajabi, or WordPress: Which Online Course Platform Is Best?